The most famous shrine in the Gion area and a patron of the arts with a 1,350 year history, Yasaka Shrine, or Gion-sha, is a beautiful site full of character and natural charm. Susano’o no Mikoto, a great god of storms and sea in Japanese mythology is worshiped there alongside his wife Kushiinada-hime and the Yahashira no Mikogami, their eight children. The colorful shrine is a popular spot for tourists and its street-facing two-storied vermilion gate is a district landmark. Once inside the gate you can access several subsidiary shrines, some of which are famous for things such as helping you become beautiful or find love in a relationship. The main hall is a lovely sight with the prayer hall in front of it strung with lanterns serving as the stage for many a cultural performance throughout the year, particularly those performed by the geisha from nearby districts. During the Gion Matsuri (Gion Festival) throughout July many events are held at the shrine, making the already popular Yasaka Shrine even livelier. The prayer hall strung with lanterns serves as the stage for many a cultural performance throughout the year, particularly those performed by the geisha from nearby districts. 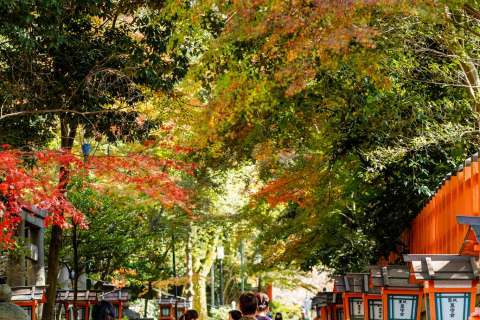 Yasaka Shrine’s welcoming entrance gate is a famous landmark and also a popular photo spot with tourists. The stairs leading up to the two-story rōmon gate are often filled with people trying to get their best shot with the well-known site. Statues of Zuishin warriors are enshrined on both sides of the gate to guard the grounds. Though it’s the shrine’s western entrance rather than its “main” entrance, this gate, flanked by large komainu lion dog statues, stands at the end of the busy Shijō Street and is more often used. At the honden (main sanctuary), worshippers notify the gods of their presence by using dangling cords to ring the large bells above before praying at the altar. This shrine is dedicated to three Japanese gods: Susano’o no Mikoto, god of sea and storms, Kushiinada no Mikoto, his goddess wife, and Yahashira no Mikogami, their eight children worshipped under one name. By making an offering and praying, the gods may ward you against evil and protect you from disasters. Please be advised that only priests and those participating in blessings or rituals are permitted to enter the main sanctuary. 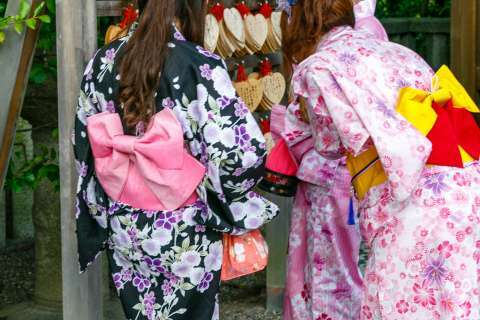 Before spending hundreds of dollars on beauty and health products, why not try a visit to the beauty shrine inside the Yasaka Shrine grounds? Utsukushii Gozen-sha is a subsidiary shrine that people go to pray in order to become more beautiful. You can pray for beautiful skin and beautiful hair, but you can also pray for a more beautiful and pure heart. 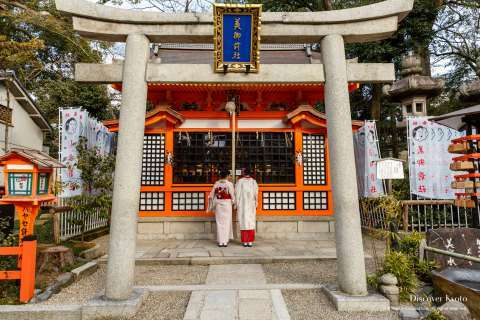 It’s said that many geiko and maiko in the district visit this shrine. Interested? There are a few ways you can enjoy this beauty shrine. According to the shrine, this magical water apparently makes your body and heart more beautiful. Catch a few drops of the flowing water from the fountain and pat it on your face. But remember not to get too greedy- just a few drops are enough for the magic to start working. Also, the water in the stone bowl is not potable, so please don’t drink it. Three different gods are enshrined at Utsukushii Gozen-sha. In order to pray to the gods, first throw in some change and ring the bell by shaking the rope. Next, bow deeply twice, clap twice and then pray to make your wish. Finish up by bowing one more time before you leave. You can write your “beauty wishes” on these wooden ema votive tablets. For example, you can wish for softer hair, silkier skin, for that pimple to disappear, or for a more beautiful heart. Write your wish then hang your plaque on the covered racks by the torii gate. A shrine with a history that began about a century before the highly cultured Heian period, construction on Yasaka Shrine began back in 656. A particularly noteworthy event occurred in 869 when a terrible epidemic had Kyoto in its grasp and diviners attributed its cause to the dissatisfaction of the ox-headed heaven king Gozu Tennō who was enshrined in Gion. Sixty six richly decorated halberds, one for each of the prefectures of Japan at the time, were displayed in the Shinsen-en garden by the Emperor and the mikoshi portable shrines were brought out from Yasaka Shrine and paraded about in order to appease the plague deity. This practice was repeated each time an outbreak occurred until it became an annual event in 970, still carried on today as the famous Gion Festival. 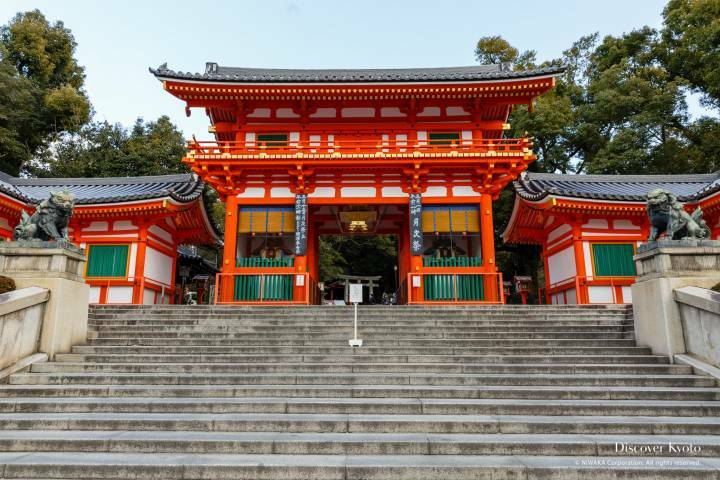 Yasaka Shrine was patroned by the imperial household in the Heian period, and in 994 was designated as one of the most important shrines where Emperor Ichijō decreed imperial missives and reports would be officially read to the gods. During the Ikkō Rebellion in 1533, the Ashikaga Shogunate declared a halt on all ostentatious religious events, but the Gion Festival was so overwhelmingly popular at this time that the common people revolted against the decision, saying that though they could do without the actual ritual portion they could not do without the festivities. During the time when State Shinto was supported by the government from 1871 until 1945, Yasaka Shrine was classified as a kanpei-taisha, meaning it was a first-ranked shrine of importance until that system was abolished in the post-war. 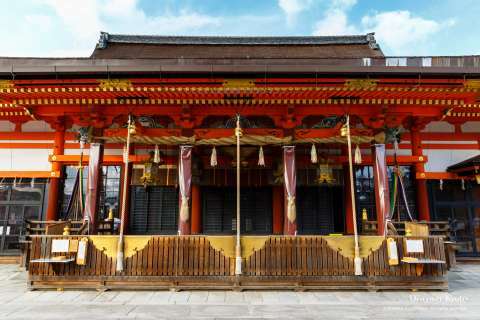 In modern times Yasaka Shrine serves as the center of Gion Festival rituals and events, as well as supporting and hosting performances and rituals featuring the maiko and geiko of the local geisha districts.